When the Trudeau Government announced the appointment of an expert panel (the “Panel”) to consider the future of the Canadian Environmental Assessment, 2012 (“CEAA, 2012”), many worried that the result would be a modest effort recommending some tweaks here and there to a profoundly broken and outdated assessment regime. Worry no more. In the end, the Panel clearly decided that renovating CEAA, 2012 was not an option; that what was needed was a detailed blueprint for constructing a brand new, next generation federal law: see its report here. While the Panel deserves kudos for both for its ambitious commitment to process, and the innovative and balanced way it has charted the law reform road ahead, credit is also due to the many Canadians that thoughtfully and constructively engaged in the review process. It is clear the Panel heard these submissions loud and clear. That CEAA, 2012 is profoundly and irrevocably flawed. 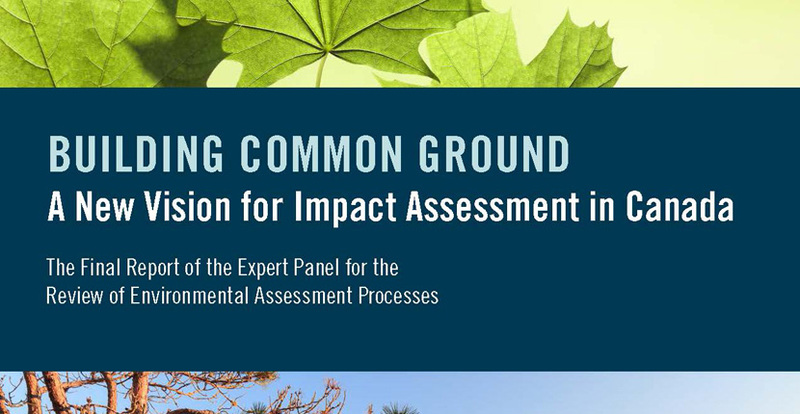 That any hope to find “common ground”, in the Panel’s words, will ultimately depend on designing an assessment process that is “transparent, inclusive, informed, and meaningful”. And so, some big changes must be made. Key among these changes is the Panel’s conclusion that, in order to ensure that the assessment process is integrated and has legitimacy, it must be overseen by an independent, arm’s length government agency. The Panel recommends that this job be given to an Impact Assessment Commission (“Commission”) with a broad leadership mandate to conduct project, region-based and strategic-level assessments. Creating such a body, with appropriate regional and other representation, will promote greater consistency and balance in the assessment process. It will also help ensure that environmental impacts and are considered within the broader context of other impacts. The Commission would also be mandated to generate its own independent science so that assessments are evidence-based and agency-led. On this point, we were pleased to see the Commission rely on the written submission we did for BC Nature. Another key feature of the Panel’s report is its embrace of “net contribution to sustainability” as the overarching assessment metric and decision tool. This is a bold and much-needed reform. It is no longer good enough for assessments to serve mainly as a way of making bad projects a little bit less bad. Operationalizing this change will be challenging. Fortunately, a lot of good work has already been done on this area, as the report reprises. Another highlight is the Panel’s commitment to ensuring that the projects are not developed without the early involvement of potentially affected Indigenous peoples and the public. A compelling illustration of what happens when this approach is not heeded is the Pacific NorthWest LNG assessment, highlighted by SkeenaWild Conservation Trust in its submission to the Panel. The Panel also offers some “ahead of the curve” recommendations with respect to Indigenous Peoples including implementing UNDRIP and providing greater clarity about how and to what extent the assessment process will play a role in the discharging the Crown’s duty to consult: see CELL’s submissions on behalf of the Tahltan Central Government. Another procedural innovation recommended by the Panel is that the Commission be given the ultimate power to make a decision on the merits of the assessment. This would be a final decision on whether a project would proceed, subject only to a carefully defined appeal to federal Cabinet. Here again the Panel is charting a new course. Formerly, these final decisions were vested in a federal Minister or, in some cases, in federal Cabinet itself. A key criticism of this old approach was that it was opaque, and insulated key decision makers from the rule of law on the pretext of judicial deference. This new approach, which will certainly endow proceedings before the Commission with a real world gravitas, seeks to inject much needed transparency into the decision making process. Our biggest concern with the Report is that it has mainly focused on procedures, values and governance – and has therefore not engaged with some of the substantive legal tests that must be embedded in a federal assessment law to give it real traction. For example, the Report does not address the need for assessments to include “worst case scenario” modeling, and only briefly touches on the need for “alternatives” assessment. These legal requirements, as our experience in the Northern Gateway, Kinder Morgan, and Pacific NorthWest LNG reviews underscore, can be of critical importance, both scientifically and legally. The Trudeau government has been given an architectural blueprint for an impact assessment regime that could serve us well, potentially for decades to come. Let’s hope it doesn’t delay in breaking ground.